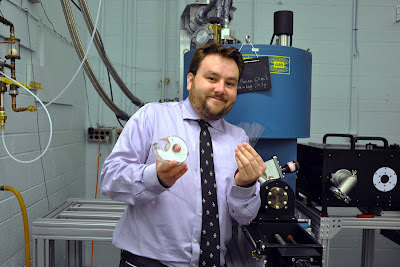 University of Toronto physics professor Ken Burch with experimental apparatus and tape. Superconductivity occurs when objects or materials that are super cooled or cooled below a certain temperature achieves no (zero) electrical resistance and expulsion of magnetic fields. Required temperatures usually approaches absolute zero. This phenomenon is quantum mechanical in nature and is characterized by the Meissner effect. The Meissner effect is an expulsion of a magnetic field from a superconductor during its transition to the superconducting state. The electrical resistance of a material slowly goes down as temperature is lowered. When it is cooled below its critical temperature, a superconductor's resistance drops to zero. Without any electrical resistance, an electric current can persist indefinitely even without a power source. Simply put, there is no power loss with superconductors and that any existing power in a superconductive wire will forever flow in it. An international team led by University of Toronto physicists has developed a simple new technique using Scotch poster tape that has enabled them to induce high-temperature superconductivity in a semiconductor for the first time. The method paves the way for novel new devices that could be used in quantum computing and to improve energy efficiency. "Who would have thought simply sticking things together can generate entirely new effects?" said team leader and U of T physicist Ken Burch. High-temperature superconductors are materials that conduct electricity without heating up and losing energy at liquid nitrogen temperatures. They are currently in use for transmitting electricity with low loss and as the building blocks of the next generation of devices (quantum computers). However, only certain compounds of iron, copper and oxygen – or cuprates – reveal high-temperature superconducting properties. Cuprates were believed to be impossible to incorporate with semi-conductors, and so their real-world use has been severely limited as has the exploration of new effects they may generate. For example, observing the phenomenon of the proximity effect – wherein the superconductivity in one material generates superconductivity in an otherwise normal semi-conductor – has been difficult because the fundamental quantum mechanics require the materials to be in nearly perfect contact. That's where the poster tape comes in. "Typically, junctions between semi-conductors and superconductors were made by complex material growth procedures and fabricating devices with features smaller than a human hair," explains Burch. "However the cuprates have a completely different structure and complex chemical make-up that simply can't be incorporated with a normal semiconductor." So instead, the team used Scotch poster tape and glass slides to place high-temperature superconductors in proximity with a special type of semi-conductor known as a topological insulator. Topological insulators have captured world-wide attention from scientists because they behave like semi-conductors in the bulk, but are very metallic at the surface. The result was induced superconductivity in these novel semi-conductors: a physics first.